Okay, we aren’t talking about those cute little “furry” chia pets today, but I do want to talk about chia seeds. 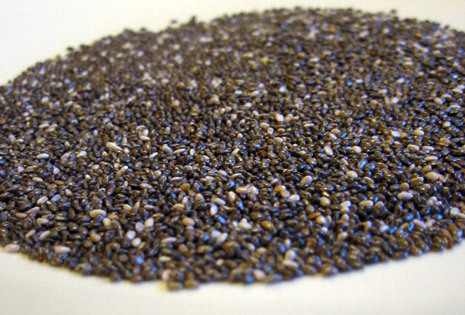 Turns out, chia seeds are actually a teeny, tiny nutritional powerhouse!� Because of it’s hydrating and energizing characteristics, this ancient wonder food is said to have been used by Aztec warriors during conquests and by Indians in the Southwest and Mexico as an energy food to keep them nourished during long trading treks. Just�one to two tablespoons�per day is plenty, and since it is easily digested and has such a mild flavor, you can easily add the raw seeds to your diet by eating them plain;�tossing�into salads, yogurt, puddings or smoothies; or even adding them to baked goods.�� Just a warning though, DO NOT eat the seeds that come with a�chia pet (they may have been grown with pesticides), instead buy them in bulk inexpensively at a local health food store like a co-op or order them online here or here. By the way, Dr. Oz also gives chia seeds his stamp of approval on Oprah, check out�the Pumpkin-Chia Seed Muffins�that he presented on the show.��You can find some more interesting recipes and information here.